WINNIPEG - Manitoba is set to table one of its most challenging budgets in recent memory Tuesday as it struggles to balance a $1-billion deficit and "strategic" spending increases without drastically hiking taxes or making deep spending cuts. Looming on the horizon is also a self-imposed deadline by the NDP government to bring the books back into balance by 2014. 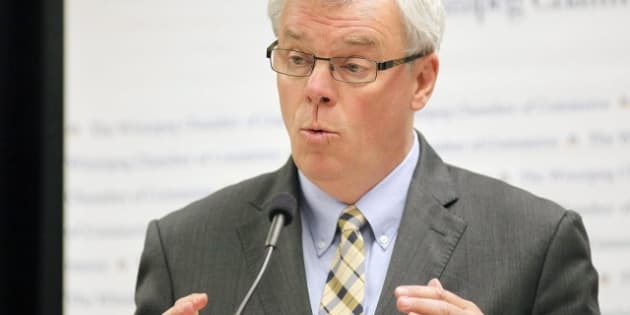 Finance Minister Stan Struthers said the province is facing "uncertain times" and this year's budget will reflect that. "We've been trying to work our way through a global economic downturn," Struthers said in an interview. "We've had unprecedented floods in Manitoba, a lot of uncertainty coming out of the federal budget. They've held our transfer payments at no increase for several years now." It will require a delicate balancing act of protecting health care, education and infrastructure while finding fat to trim, he said. Manitoba's deficit has ballooned to nearly $1 billion — double what the province projected — thanks in part to last year's massive flood and increased spending. Flooding costs were expected to come in around $800 million, although half of that is expected to be covered by the federal disaster assistance program. The NDP is also spending some $93 million more on families and public safety. This increased spending comes at a time when core government revenue is about $42 million lower than budgeted, according to last December's fiscal update. But this doesn't mean the NDP is going to stop spending altogether, Struthers said. "What our approach will be with budget 2012 is to protect the things that matter most to Manitobans — health care, education, skills training, infrastructure — you'll see us stepping up and protecting those sorts of things," he said. There will be cuts in other areas, Struthers added. But he declined to specify exactly where the spending cuts will come from or what areas are less of a priority to Manitobans. "Restraint will be part of the message that we send out but not just restraint for the sake of restraint. We need to restrain spending so we can focus on Manitoba's priorities," he said. "We believe we do have some opportunity to reduce administrative spending." Many doubt the NDP can achieve the kind of savings it needs without much more drastic measures. Conservative Leader Hugh McFadyen said he hopes the government will be "upfront about the scale of the challenge" facing the province. Slow growth combined with the crippling deficit will require some tough decisions which McFadyen said the NDP isn't prepared to make. He pointed to the plan to build a costly hydro transmission line up the west side of Lake Winnipeg rather than the east side which the NDP is hoping to get approved as a UNESCO world heritage site. Public sector salaries should also come under the microscope, McFadyen said. "I'm not optimistic that this government has the will to do it," he said. "It involves tough discussions with public sector unions who played a large role in the (NDP) re-election campaign. For that reason, I'm not optimistic that they're prepared to sit down and have the tough negotiations required to reduce costs along those lines." In the meantime, McFadyen said the NDP is finding other ways to raise revenue on the backs of the province's families. In the last few months, McFadyen said hydro rates have gone up, daycare costs are increasing and property tax rates are on the rise. It's possible to bring Manitoba back into balance without increasing costs for taxpayers, McFadyen said. "This is a prime opportunity for the government to do a program review, identify programs that may no longer be working and look at finding savings in those areas," he said.